The warm temperatures came early this year, and came with the promise of much needed rain. The rain never came even with a prediction of 100% chance. And then temps made Florida cooler than Denver, but just for a couple of short days. You just have to roll with the schedule that Mother Nature gives you sometimes, and hope that your plants can hang on as well. The window boxes got planted along with a few of the large pots. I don't think I've changed colors much in several years. Whatever colors feed your soul just keep calling you back again. The sweet potato vines in both the margaurite lime green, and the blackie deep purple, are so easy to grow and their colors and vine habits are so perfect for a window box as well as a ground cover. They are also fool proof for propagation. Just stick any clippings you have in water and they will grown roots easily and be ready for the garden in no time. 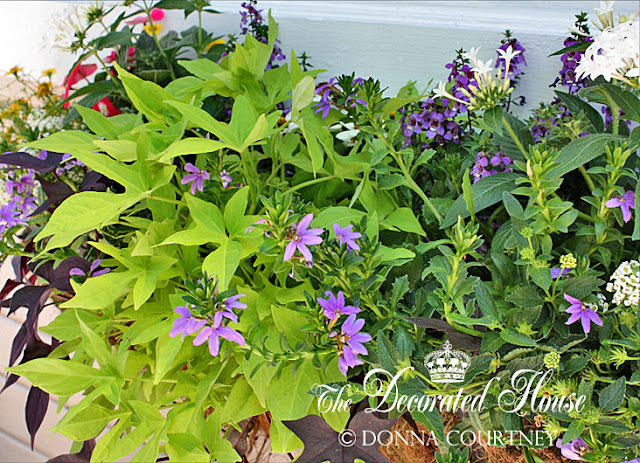 The lighter purple to lavender flowering plant in the front is also a vine and is called scaevola. The back area has angelonia, which will get a bit taller, along with the white pentas. All of these will take lots of sun as long as they are kept watered. This box should last through the rest of summer. Mostly we have been reworking the front planting beds. Grass suffers drastically down here high temperatures and lack of rain. When we first sodded out there, it rained for 5 or 6 days with no break. Of course that caused a lot of it to die from fungus due to too much water. And that is the cycle we often have to grow with, too much heat - not enough water, then too much water. It can be tough to find plants that will do well with heat, drought and too much water! But we still try to coax the little lovelies to do their best and be a part of our garden.